These two silly sci-fi comedy “monster” movies ensure the death of your precious time and are still as bad as ever. I actually think this is the first time I’ve truly sat down to watch them all the way through…and I have one of them in my movie collection (no thanks to a 4-film collection). It focuses completely on the military and the government rather than everyday people taking on the tomatoes. Yawn. There’s simply no one to relate to in this film. A preface about the movie The Birds turning into a reality—suggesting this could, too—sets the tone of slapstick stupidity of the film. While not nearly as funny, the humor reminds me of the Airplane brand of comedy. Tomatoes on a Plane? Oops, I better not even put that out in the universe lest it become reality. 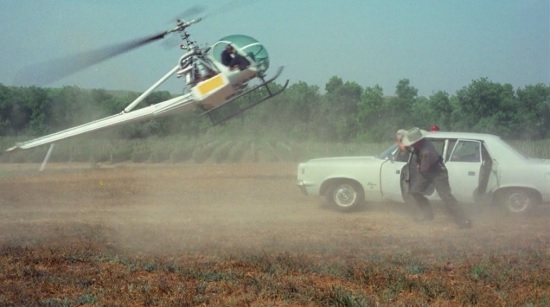 I’m shocked this movie had budget enough for even a major helicopter scene. 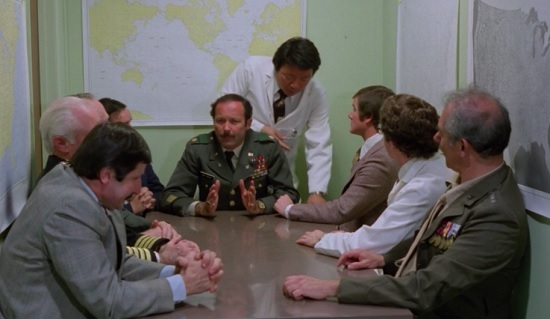 While the main cast is all military and government, the everyday victims are attacked in kitchens, in the water for a Jaws spoof, in grocery stores, in the woods, and on the streets. …and musical numbers! Ugh. 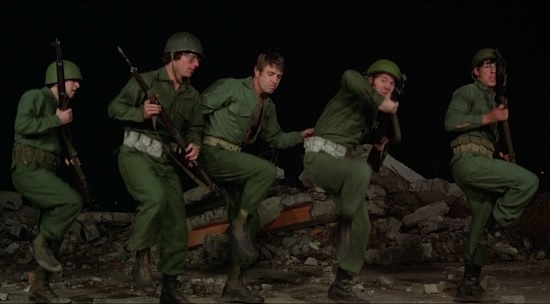 But I must say, the lead singer of the military musical number totally rocks his performance. Also keep an ear out for a weird talking dog moment. For me, the highlight of this piece of trash is a totally dated joke: a commercial for a K-tel album called “Dead Beat”, which includes all original hits by original dead stars. So wrong. 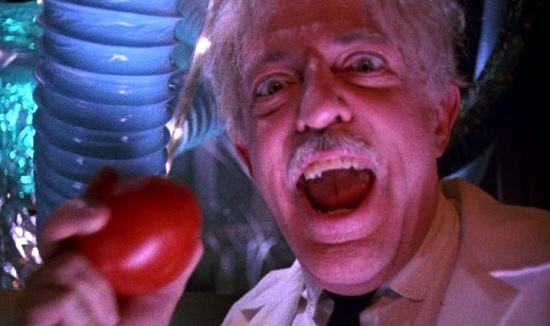 Ten years later the original director brought the tomatoes back for the 1988 film Return of the Killer Tomatoes! The best thing about the sequel is probably the revised version of the theme song with lyrics spoofing the first song. The Addams Family alum John Astin plays a mad scientist. 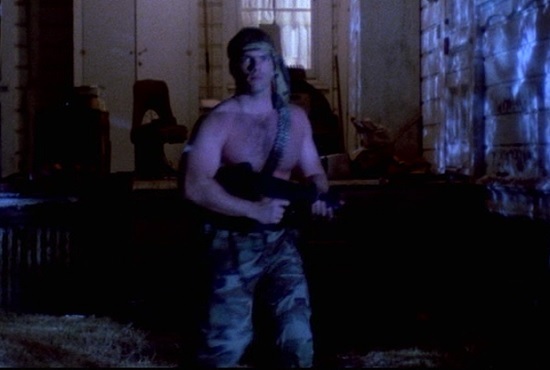 If I followed correctly, he can turn killer tomatoes into mortals…most of them hunky shirtless military men. He also creates a bombshell woman out of a tomato, but she breaks free of his insanity, taking her furry pet tomato with her. Honestly, this film is so bad even by 80s standards I couldn’t totally commit to paying attention to it. At least this time the focus is on two horny, ordinary 80s guys—Anthony Starke of Repossessed and George Clooney, who appears to have had time to star in this disaster between getting eaten by the shark that The Facts of Life jumped and his short-lived inclusion on Roseanne. 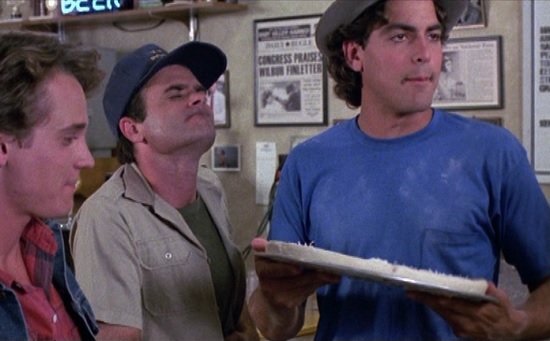 Starke and Clooney work at a tomato-free pizza parlor, because tomatoes have been banned by law since the first attack. Starke sets his sights on Astin’s bombshell creation, they begin dating, and he starts noticing she’s rather odd. As he falls in love with her, he and his buddy Clooney realize they have to infiltrate Astin’s lab and get control of his conversion machine to save her from her tomato existence. This machine appears to run with the help of music, and the song of choice dictates what the human looks like. For instance, play the theme to Miami Vice and you get Don Johnson. Okay, I’ll give this part props for its 80s indulgence. And hey, I’m a fan of self-deprecation, but by the the time this film admits it has no money left so the characters start talking to the camera with product placement (Pepsi, Nestle Crunch, Crest, beer brands), all it manages to do is demonstrate that you can’t save an unfunny movie by being even less funny. Aside from the theme song and the hunks, the biggest highlight for me in this mess is a Tane Cain poster hanging on the guys’ wall, six years after her awesome album failed to become a hit. 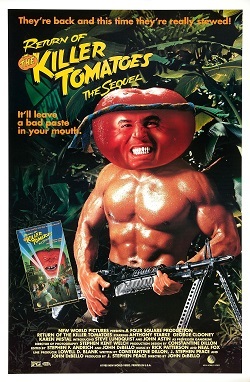 The original director returned with Killer Tomatoes Strike Back! 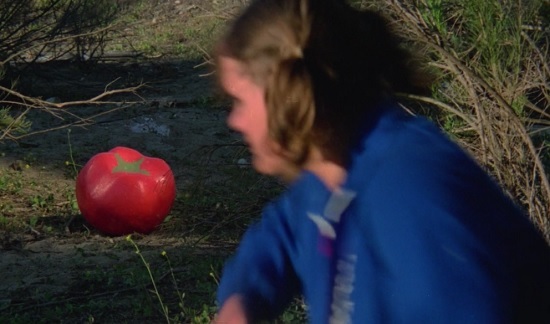 in 1991 and Killer Tomatoes Eat France! in 1992, but I simply couldn’t bring myself to watch another of these films. Okay, I’m lying. I simply couldn’t find them on any streaming service. 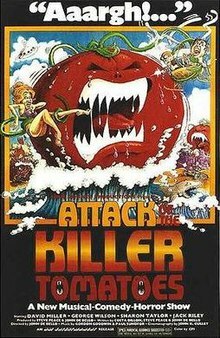 This entry was posted in Living in the 80s - forever, Movie Times & Television Schedules - Staying Entertained, Scared Silly - Horror Comedy, Sound Check - The Songs Stuck in My Head and tagged Attack of the Killer Tomatoes!, horror comedy, Return of the Killer Tomatoes!. Bookmark the permalink.